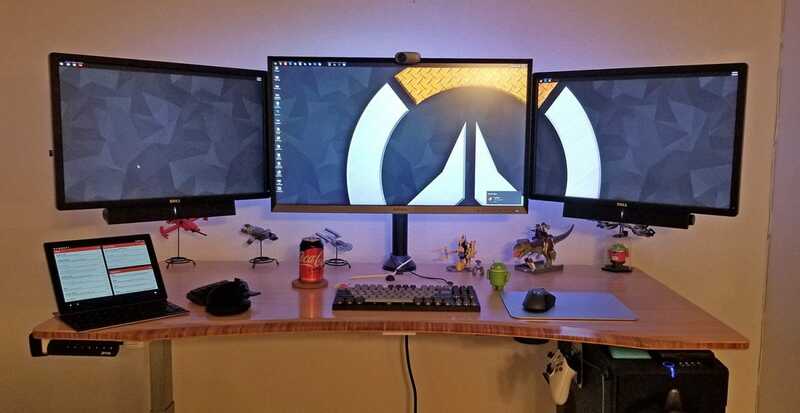 You’ve finally built that monster triple monitor desktop setup you’ve been dreaming about. But now your desk is 80% monitor stand. You need a monitor mount that frees up space and looks sharp doing it. As monitors have gotten thinner and cheaper, more and more of these multi-display stands have come to the market, but there are really only a few basic variations in the design. 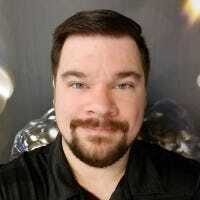 Rigid arms or flexible? Clamped to the desk, drilled through it, or freestanding? The following picks should cover the majority of users. Unfortunately there’s not much in the way of selection for wall-mounting triple displays; the combined weight of three monitors and steel stands makes it impractical, and three individual wall mounted units will probably work better in that situation. Before making your selection, you should decide on your mount style. A clamp mount that attaches to the back of your desk will work for most users, but those with glass desktops or desks with no lip edge or a thick top may need something freestanding. That’s also the best solution if you infrequently move your setup. If your desk has a handy grommet hole for wiring, you can use it for a grommet mount, or drill it yourself if you have a big enough drill bit and can access the underside easily. Oh, and all three of your monitors will need a standard VESA mount on the back—newer and more stylish models sometimes omit this feature (or require you to purchase special adapters from the manufacturer). As a big fan of triple displays, I’ve tried quite a few of these stands, and I’d discourage anyone from picking one with hinged arms for the side monitors. These hinges tend to creak and bend after a short while, especially if you use bigger displays. The EZM Deluxe Triple avoids this design with rigid steel arms held in place with big bolts under the central VESA mount. I’ve used one for over a year and haven’t noticed any sagging in the left and right displays. 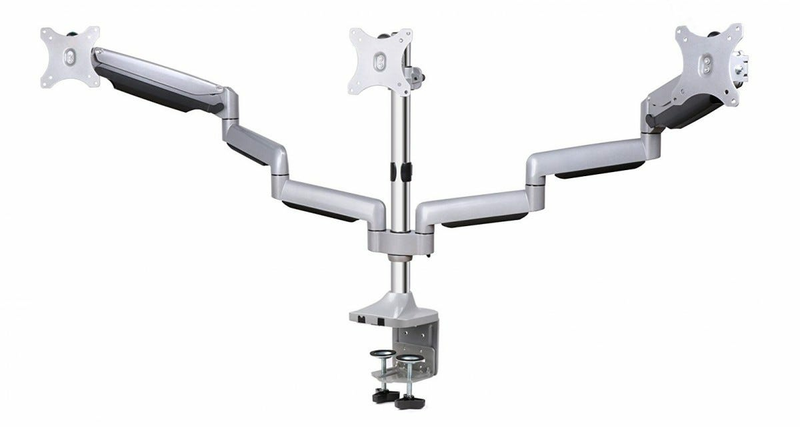 The EZM model is relatively simple, with only a master height adjustment (more bolts) and sliding mounts on either arm, but it does allow you to rotate all three monitors 360 degrees and both pan and tilt the outer displays. The seller offers both a clamp mount and a combination grommet/freestanding option with a massive (and heavy!) steel plate base, and the central pipe is hollowed out for decent cable management. Thanks to the relatively simple design, this one is also the cheapest on the list and makes an excellent budget pick. If you want something that looks a little more professional but requires no additional mounting or modifications to your desk, the Ergotron LX Triple is a great pick. A single piece of metal for all three VESA mounts keeps the displays parallel, and it can be raised or lowered on the track in the central column without any tools. The drawback to the all-in-one design is that it’s massive—probably too big and oddly-balanced for one person to safely lift, with all three monitors installed. It also can’t handle displays bigger than 24 inches diagonally, unless you take advantage of the rotating mounts to arrange them vertically. Make sure you have plenty of room on your desk, and perhaps a mat to place underneath the stand, since all that weight can bite into a finished desktop like a puppy on a power cable. Most users with triple displays want them to be more or less static, but if you need to move your monitors around on a regular basis, the AVLT-Power Premium is for you. Its flexible arms are supported by a piston system that’s more reliable than simple hinges, and will stay put when you let go. It makes for a very handy solution if you often turn your monitors to landscape mode for reading. 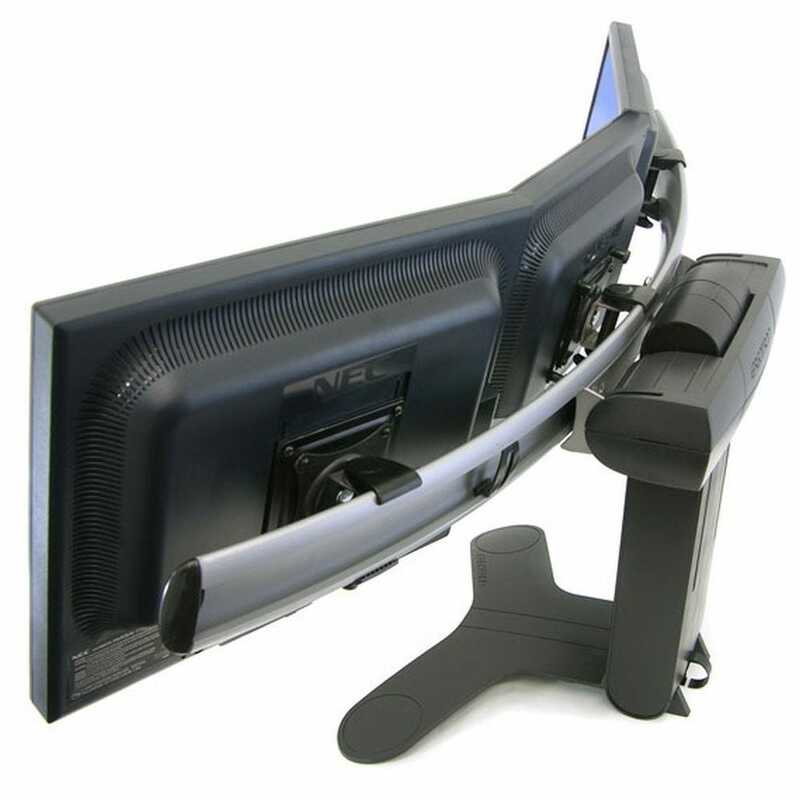 The outer arms can extend in towards the user by more than two feet (though bigger center displays will limit this range), and monitors can be quickly swapped in and out of the mounts thanks to detachable VESA mounting plates. The aluminum finish looks snazzy, which is a good thing if you’re planning on using those flexible arms to present things to your office mates. The only major drawback is the integrated cable management system: the plastic tabs that hold the cables in place are prone to snapping. It’s an easy enough fix, but a let-down considering the solid presentation of the rest of the product. Edge clamp and grommet mounts are both supported, though the combined weight of the pistons and monitors means you shouldn’t try to install this on a smaller or cheaper particle board desktop. The mounts above can’t take three monitors bigger than 24-27 inches, though you can double-up on larger displays and simply leave the central mount empty. But if you have a triple monitor setup of truly epic proportions, with three screens each at 30 inches or larger, you’ll need something a little beefier. At those sizes and weights clamp and grommet mounts become impractical. The Amer AMR3S32 solves the weight problem by doubling up on freestanding columns, allowing for three oversized screens. The VESA mounts even support the TV-sized 120mm plate. With displays installed, the whole shebang will be over six feet long, so you’ll need a massive desk or table hold it all as well. This is another one that might need two people to set up safely. If you’re building something that simply can’t be accommodated by a standard desk, look into the Trak Racer mount. 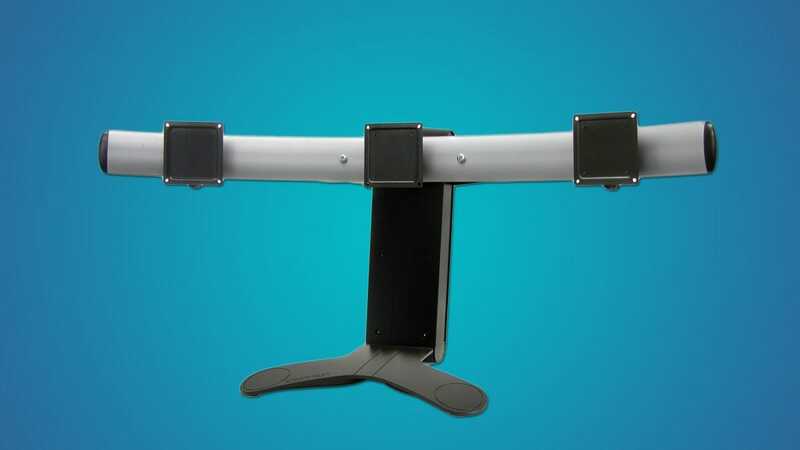 This oversized stand sits on the floor instead of the desktop, allowing it to support displays at up to 45 inches for all three monitors. It’s designed for racing and flight simulators with a separate “sled” chair, but it should be workable with a typical PC so long as its stabilizing feet can fit behind your desk.